For a while now, rumors and speculations regarding OnePlus 5 have been all over the internet. With the expected summer release date drawing closer with each passing day, newer leaks and speculations keep coming in and this time, we have the details of the phone’s alleged specs and features thanks to AnTuTu benchmarks. Before today, OnePlus 5 had previously appeared on Geekbench, showing impressive scores when taken through single-core and multi-core tests, much like other 2017 flagships. While the Geekbench listing did not give us many details about this phone, the latest AnTuTu benchmarks have more to offer. 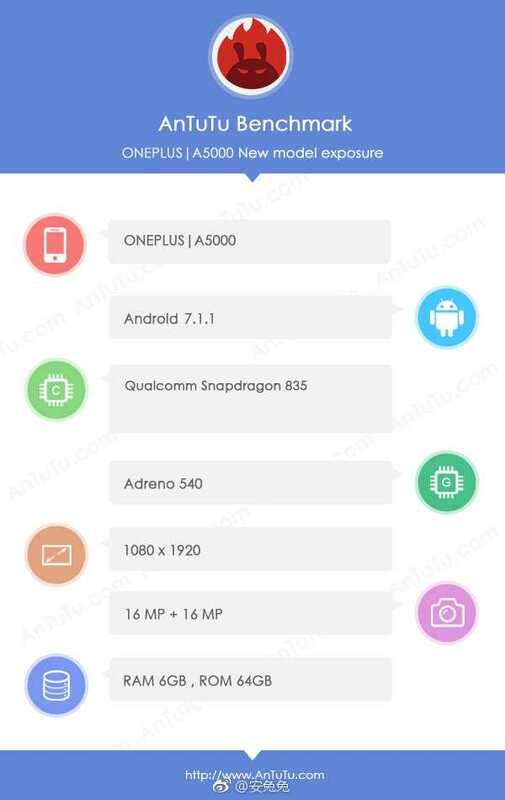 Apparently, OnePlus 5 will ship with the expected model number A5000. Under the hood, the flagship killer will come in with the new Qualcomm Snapdragon 835 processor that’ll be paired with the same 6GB RAM that made highlights in 2016 thanks to the OnePlus 3 and 3T. Even though there’s no mention of the screen size, the listing confirms that the Chinese OEM will stick to a 1080p display resolution, much like its previous flagships. We’ve heard rumors that OnePlus 5 will come in with a massive 256GB storage variant, but from the look of things, this might not materialize. The listing shows off a 64GB ROM, same as the base model on the OnePlus 3 and 3T, however, the camera combination takes after the latter, where there’s a 16MP lens on the back and a 16MP lens on the front. Still, some sections are adamant that the phone could feature a dual-lens camera on the back. Similar to the Geekbench listing, the OnePlus 5 listed on AnTuTu has Android 7.1.1 Nougat running the show, which is actually the expected. Other than these, the latest benchmarks have nothing more to offer, but it’s easy to believe the listing, especially since it coincides with a lot of what has already been mentioned in previous rumors and speculations about OnePlus 5. With summer release date still weeks away, be ready for more of these rumors, leaks, and speculations. Stay tuned.